Despite differences between campuses we did hear some common themes about spaces that students found problematic, including maintenance concerns, crowding and noise, and lines for services and resources. Students at the campuses that are somewhat more space-constrained and with less availability of outdoor space, student lounge areas, and other amenities were more likely to note the limitations they faced when on campus all day than were those students at campuses with a more traditional, larger quad layout. This is the Student Resource Center. It’s…you get, I think, three hundred pages of free printing every semester. 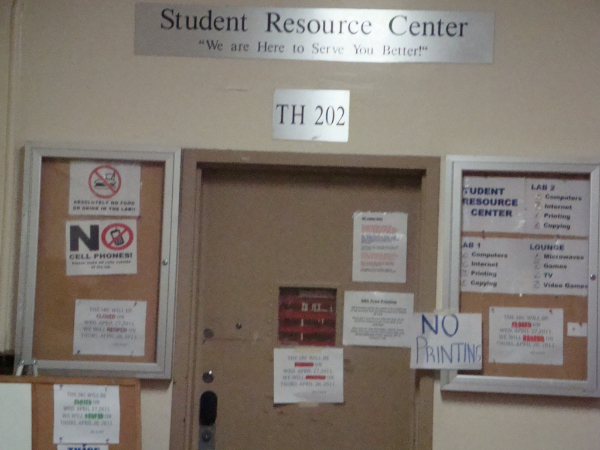 As you can see, that sign says “No Printing.” This has been like this for the past two weeks and this is like during our papers and… When you do go in sometimes the printers aren’t working… You have to wait, like forty minutes. 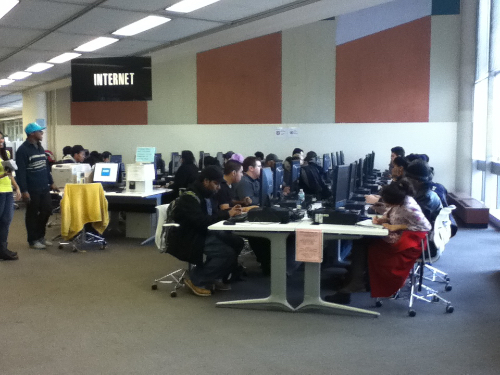 The school is supposed… I mean, this is the Resource Center, but you don’t get much help. 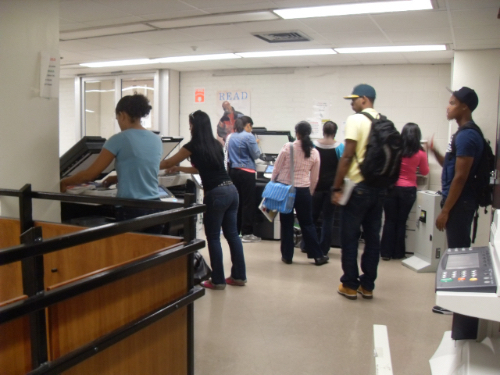 This is definitely the spot I don’t like because to make copies of textbooks takes forever here. I don’t even bother anymore I just get the book because this line is always atrocious. Yeah, it’s always really ridiculous. Sometimes you have students copying thirty pages, so that is definitely the one I don’t like most in the library. Yeah, I was taking a picture mostly of the scaffolding we have and the blocking off their staircase. 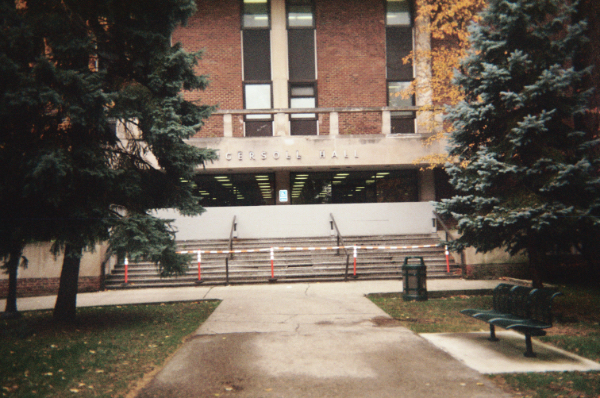 And so, all of the students have to go all the way around to just get to the entrance of Ingersoll. […] I guess the steps are all falling apart and they didn’t want the students to use it. I mean, I think they’re waiting to do work on it, but right, it’s been like that for awhile. So I don’t usually go through that entrance. I’ll go through the other entrance and then walk through there. It says it’s a “Learning Resource Center,” but in actuality it’s a “Hang Out With Your Friends and Look at Your Cousin’s Wedding Pictures Center”… “on Facebook.” [[slight laugh]] I guess it’s categorized as a Learning Resource Center, where you can sit and do your homework and print… I would assume that’s what it’s for. Who knows. All I know is that it’s kind of hard to focus writing an essay when people are socializing. 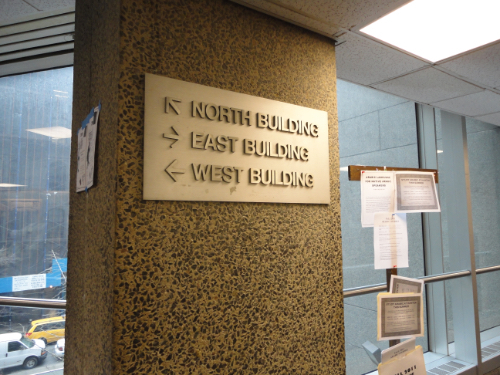 I don’t like the, like, the third floor area where it connects to all the buildings. ‘Cause it’s too crowded. […] That’s the only thing I don’t like about the school, is like how crowded it gets when you’re trying to get somewhere…there’s like too much people brushing and bumping into you. Another student agreed: And the best thing we have is the bridge, which is definitely one of my least favorite places in the school ’cause of all the over crowdedness. Student: “Place in the library that I don’t like.” It’s, there’s only two stalls in, on the first floor and normally it’s not clean. So. Interviewer: I am also familiar with that bathroom. 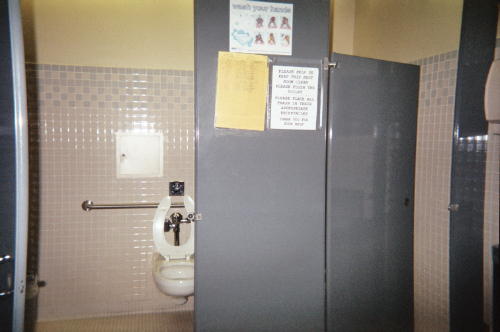 [A place at school that you don’t like] was hard to find. 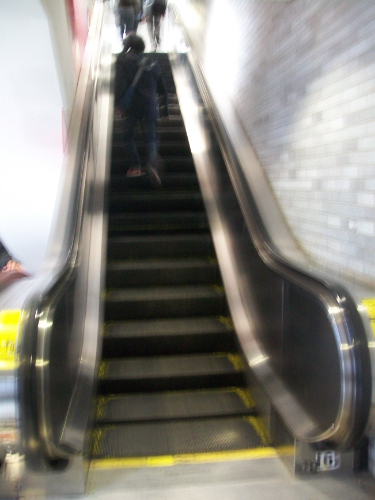 [[slight laugh]] Until I was going to class in the morning and the escalator wasn’t working. And that always happens on the 5th floor. Which is so annoying because most of my classes are on the 6th floor so I have to go up the escalator that’s not working. I hate that. That’s the North Elevator. That is a place in school that I don’t like. ‘Cause these elevators take forever. And then, when you finally get an elevator, sometimes it’s packed because I think some people here are extremely lazy and, you know, half of the people in the elevator are going from, like, the first floor to the third floor. It’s like: come on! You could have walked this. And, so the elevator is packed, takes forever to come, and part of the reason why it takes so long to come is because as soon as the elevator doors are about to close (everybody’s been through this), somebody runs up and puts their hand in the way and then the elevator door opens again and then it’s about to close again…somebody else does it. And it opens again. So, I rarely take the elevators. Unless if I’m really in a hurry. Or when it’s on break and there’s not that many students in the building.